Copper has an undeserved reputation as being hard to clean. It does need a little special attention from time to time. However, the process is quite easy and should not scare you away from purchasing or using this wonderful material. Best of all, you can care for your copper with all natural materials, keeping your home and the environment healthy. For cooking, you absolutely cannot find a better material than copper. It conducts heat evenly and efficiently, exactly the properties you want in your cookware. Moreover, don’t discount the decorative value of copper. You can proudly hang those copper pots in your kitchen. To help you understand how to care for your copper, I have put together this article with cleaning tips and methods to keep all your copper bright and shiny. Take care of your copper, and it will last for a very long time. In most cases, hot water and a little dish soap will quickly get them clean. It is important to dry copper completely after washing. Water remaining on the pot encourages tarnish to form. If you do find tarnish, black spots or a green-blue patina, a mildly abrasive copper cleaner such as Brasso or Wright’s Copper Cleaner quickly clean it away. Sprinkle copper cleaner on the spot and scrub with a damp sponge. Rinse thoroughly and dry. The acidity of the lemon, combined with the abrasiveness of the salt make quick work of mild tarnish. Cut a lemon in half and sprinkle the surface with table salt. Rub the tarnished spots with the salted lemon and rinse. Dry thoroughly. Rub on copper with a soft cloth and allow to sit on tough spots and rub again. Rinse with warm water and dry with a soft cloth. Mix equal parts lemon and baking soda and rub on tarnished spots with a soft cloth. The baking soda is mildly abrasive while the acid in lemon juice dissolves the tarnish. Rinse thoroughly and dry. Soak a cloth or rag in white vinegar and apply a little elbow grease to remove tarnish from the surface of pots and pans. When the cloth becomes soiled with tarnish, move to a new section of the cloth and keep rubbing. This method takes a little work, but it results in a beautiful shine. Rinse the item thoroughly and dry. Like vinegar and lemons, tomatoes are acidic and provide the cleaning action. The thickness of the tomato paste helps hold it in position for longer cleaning time and a better shine. You can use tomato paste, tomato sauce, or ketchup for this quick cleaning tip. Rub the tomato paste over the pot with a clean rag. Rinse and dry. This quick DIY brass cleaner recipe cleans copper or brass without harsh chemicals or too much work. 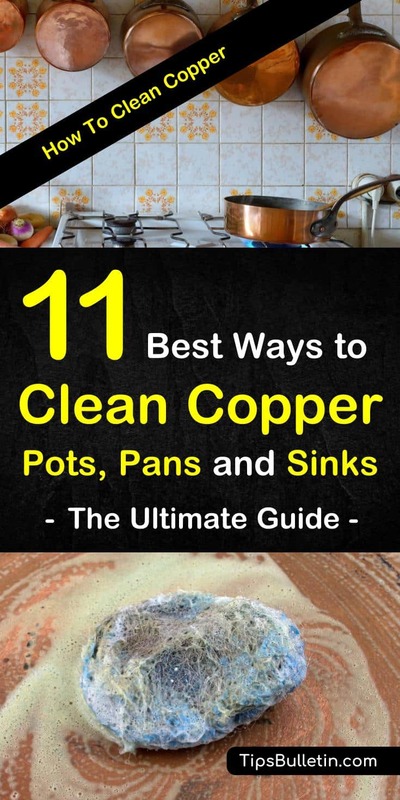 For more on homemade copper cleaner recipes, check out our copper cleaner tips. Cream of tartar is a mild acid and slightly abrasive. Combine two tablespoons of cream of tartar with enough lemon juice to moisten and form a paste. Rub the mixture on the copper with a soft cloth. Rinse and dry completely. Use a mildly abrasive sponge with any of the above methods to give extra scrubbing power for tough stains and tarnish. Use as needed and avoid scratching your copper. It is best to avoid abrasives completely whenever possible, so use this method only if all else fails. When your copper item is badly tarnished, your first inclination might be to grab a Brillo pad or some abrasive cleanser and start scrubbing. This is a huge mistake. Abrasives like steel wool or common cleansers can scratch the copper and leave it damaged beyond repair. The safest way to clean badly tarnished copper is to use a homemade copper cleaning paste, time, and a little elbow grease. Mix the ingredients together to form a loose paste. Slather a thick layer of the mixture onto the copper with your hands, covering the entire item with a layer of paste. Wrap the item and paste in plastic wrap or place it in a plastic bag and seal. Allow the copper to soak in the paste for four hours or more. Wipe away the paste from a small area with your finger. If the copper needs longer, replace the paste, put it back in the plastic wrap, and allow it to sit overnight. Wipe off the paste and wash the copper item in hot soapy water, rinse, and dry. Repeat the process as needed until all tarnish is removed. If only a few spots of tarnish remain, rub them with the paste and a soft cloth. Polish the copper dry with a soft cloth. Apply a thin layer of oil to prevent future tarnishing. Copper bottom pans and pots are excellent for cooking. The copper conducts heat extremely well and heats the pan quickly and evenly. For everyday use, clean copper bottom pans like any other pan. Use hot soapy water and a soft cloth. Rinse thoroughly and dry the pan completely with a dry towel. Drying copper is necessary because water encourages the copper to tarnish. Your copper sink has a natural patina that protects the surface and keeps it from tarnishing. However, some foods can damage the patina or even damage the copper sink. Rinse the sink thoroughly after using toothpaste, vinegar, mustard, pickling and brining solutions. Over time, the patina on a copper kitchen or bathroom sink will begin to degrade. If this continues, the copper may tarnish. Clean and protect the copper sink by applying a high-grade plumbing wax whenever you notice that water no longer beads up on the surface. When cleaning jewelry, you often have a mixture of copper and other materials including gemstones or other metals. A good DIY jewelry cleaner will clean and protect all materials. You need to be sure that any method you use is safe for the other materials as well as the copper. These methods are recommended for pure copper jewelry and may not be safe for other materials. Use with care. Lacquered copper jewelry that needs cleaning, but is not tarnished, cleans easily with soapy water. Rinse it completely and dry. Then buff the dry jewelry with a jewelry polishing cloth. Stir and place the jewelry in the solution and soak it for a few minutes. Remove from the solution when clean, then rinse thoroughly and dry completely. When your jewelry has many crevices that need cleaning, this method is the easiest. Place the jewelry in the solution and bring to a boil over medium-low heat. Allow the solution to boil for a few minutes. Now remove the jewelry using tongs and allow to cool completely and rinse thoroughly and buff completely dry. Copper mugs clean up nicely with the use of lemon, salt, and a little elbow grease. Best of all, this method is environmentally friendly and uses only natural ingredients. There are no chemical residues to cause problems later. If you do not have a lemon, you can accomplish the same results with vinegar and baking soda following these directions: Dip a soft cloth in vinegar and sprinkle the mug with baking soda. Rub the mug and baking soda with the vinegar soaked cloth until the surface is shiny. Now rinse completely and dry with a towel. Put the pennies into the solution for 5 to minutes. Remove the pennies and rub the surface with a soft cloth. Finally rinse well and towel dry. You may have read or heard that copper is poisonous and should not be used for cookware. I want to assure you that modern copper cookware is completely safe and easy to use. Modern copper pans are lined with an alternate metal on the inside. The copper never comes into contact with your food and poses no danger. There are a few special use copper utensils that are not lined, such as a copper bowl for beating egg whites. These utensils, when used for their intended purpose are completely safe. You have nothing to fear from modern copper cookware and utensils. Why Is Copper Best for Pots and Pans? Copper conducts heat extremely well and spreads the heat evenly across the bottom and up the sides of the pot. Copper pots and pans have no hot spots, so you don’t have to worry about burning and sauces separating because of uneven heat. Copper is a better conductor than aluminum or stainless steel. Many pot makers will brag about the thickness of the aluminum core designed to spread the heat. The green tarnish that forms on copper pipes is no different from the tarnish that forms on your copper cookware; it is just in a more advanced stage. As copper tarnishes, it first forms brown or black spots which turn green over time. The green tarnish is not harmful to your pipes, but it does look unsightly. If you want to clean the pipes back to their shiny copper finish, you can use any of the copper cleaning recipes we have given you above. Probably the most used method is to rub the pipe with a salted lemon and allow it to sit for a few minutes before cleaning the lemon juice and salt off. You may need to repeat the process a few times to return the copper to its shiny surface, but it will work. I hope you have enjoyed this article and that you learned more about how to care for your copper items. 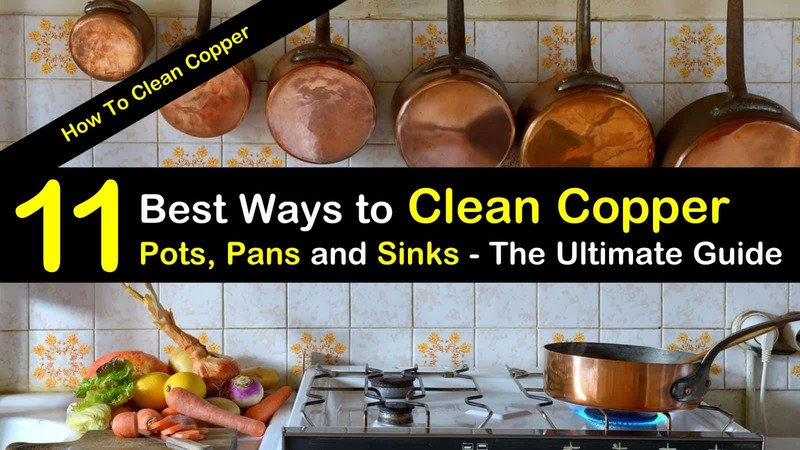 I have tried to cover every method of cleaning copper and information about cleaning different types of items. If you enjoyed this copper cleaning and polishing article and found it useful, please pin it or share it on social media. Let’s spread the word about how easy copper is to clean and care for so that more people will feel confident purchasing and using this natural material.